Check out these Hogwarts-like schools to make your college application process a bit more magical. We know that millions of students grew up reading the Harry Potter series, so it’s no wonder that so many of us are drawn to the universities that actually resemble the fictional wizard academy of Hogwarts. The majestic appearance and Gothic architecture of J.K. Rowling’s Hogwarts screams “academia.” And, what’s more cozy than making new friends in your own private dormitory? Check out these schools if you’re a Harry Potter fanatic who hopes to spend their college years practicing spells, playing quidditch and occasionally saving the world. 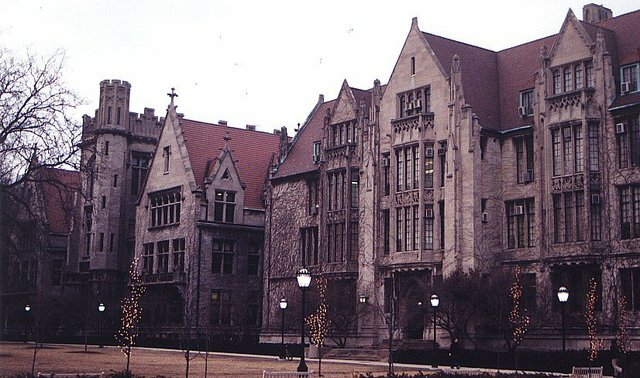 Located in Chicago’s Hyde Park neighborhood, UChicago is perhaps the most Hogwarts-like of any U.S. school. Looming, gothic structures cover the campus, and there are even gargoyles on many of the building facades, which is a nice bonus. Despite being in a major city, the University of Chicago can also have a quiet, isolated feel in certain parts of campus, adding to the Hogwarts grounds atmosphere. This school also has housing communities on campus that resemble those of Hogwarts. Much like the houses of Gryffindor, Hufflepuff, Ravenclaw and Slytherin, each residential community at UChicago has its own distinct traditions, whether it’s weekly movie nights or broomball. It's easy to imagine running into Pomona Sprout at the University of Chicago. Located just outside Philadelphia, Pennsylvania, Bryn Mawr College features several gorgeous, castle-like buildings on its property. Wander through this historic campus and you’ll see stained glass, fireplaces and other finer details reminiscent of Hogwarts. Interestingly, the school’s mascot is an owl, though there’s no owlery like Hogwarts. Notably, students at Bryn Mawr seem to have fully embraced their school’s similarities with the wizard academy. Bryn Mawr has had a quidditch team for over a decade, and they’ve even held a Harry Potter-themed “Hogwarts Dinner” in the Thomas Great Hall, which closely resembles the dining hall where Harry, Hermione and Ron sipped on pumpkin juice and ate Yorkshire pudding. The quad at Cornell would be perfect for practicing quidditch. If you’re looking for historical charm paired with the Hogwarts look, check out Yale University in New Haven, Connecticut. As the third-oldest college in the U.S., this university takes after universities in England and Scotland and is known for having a series of hidden underground passageways that connect certain parts of the campus, just like Hogwarts. The sense of house loyalties and rivalries are also present through the twelve residential colleges and the university’s infamous secret societies. Plus, there’s one very unique perk: Yale actually offers a course on Harry Potter through the comparative religion department. Even though Yale looks like Hogwarts, we bet the cleaning staff is friendlier than Argus Filch. It should be no surprise that another Ivy League school is on this list. Cornell University in Ithaca, New York has that same Gothic-inspired architecture found in other historic universities in the U.S. Cornell’s Risley Residential College is so similar to the famous wizard academy that they hold Hogwarts-themed events there. For some added Hogwarts charm, visit the Law Library; in addition to having vaulted ceilings and cathedral-like windows, its hanging chandeliers will instantly remind you of the floating candles in Hogwarts. Meanwhile, the long passageways of Cornell’s War Memorial, complete with arched windows and intricate stone designs, look much like the hallways where Hogwarts students traveled to and from their classes and dormitories. The campus even sits atop a steep hill above a lake, just like Hogwarts (though don’t count on any mermaids living in there). Cornell students are also known to wear red scarves to the popular and spirited athletic events, much like the quidditch matches . The dorms at Cornell are so cozy, you'll want to curl up with a butterbeer and an autobiography of Helga Hufflepuff. We can’t all be wizards and witches of the finest degree, and your professors probably won’t be quite as interesting as Sybill Trelawney or Filius Flitwick. At these Hogwarts-like schools, however, a college education is a bit more magical. Check out these schools if you’re a Harry Potter fanatic who hopes to spend their college years practicing spells, playing quidditch and occasionally saving the world.